There is now a new labyrinth at this extraordinary and historically significant place. In the church Mariä Schutz a labyrinth was built during the three-year period of renovation and rebuilding on the area of the Vogelsburg. Father Bernhard Stühler, hospital chaplain of the Juliusspital, initiated it. Architect Stephan Tittl from the office SequenzSieben Würzburg made the architectural design of the church and delivered the layout. During the inauguration of the project turned out, that Sr. Hedwig Mayer, prioress of the Augustinusschwestern on the Vogelsburg, always had wished a labyrinth. It’s a newly created sector labyrinth with 5 circuits. In the middle is a bowl-shaped pitch circle to divert the direction. The dividing bars form a cross and are arranged symmetrically. The diameter amounts to 6 m, the middle to 2 m. The ways are 34 cm wide and are marked by a 6 cm wide brass sheet on the terrazzo floor. The way into the center amounts to about 64 m.
One enters the church from the south over an outside stair. On the left hand of the entrance is the labyrinth which is aligned to the west and the east. You enter it from the west, arriving the center, one looks to the east in the direction of the altar and leaves it also again in this direction. With the elected interior design and with the labyrinth in the ground we would like to offer to every visitor of the Vogelsburg the possibility to find the way to one’s own center, to get back to basics and to find the possibility of steering towards God in the church space. 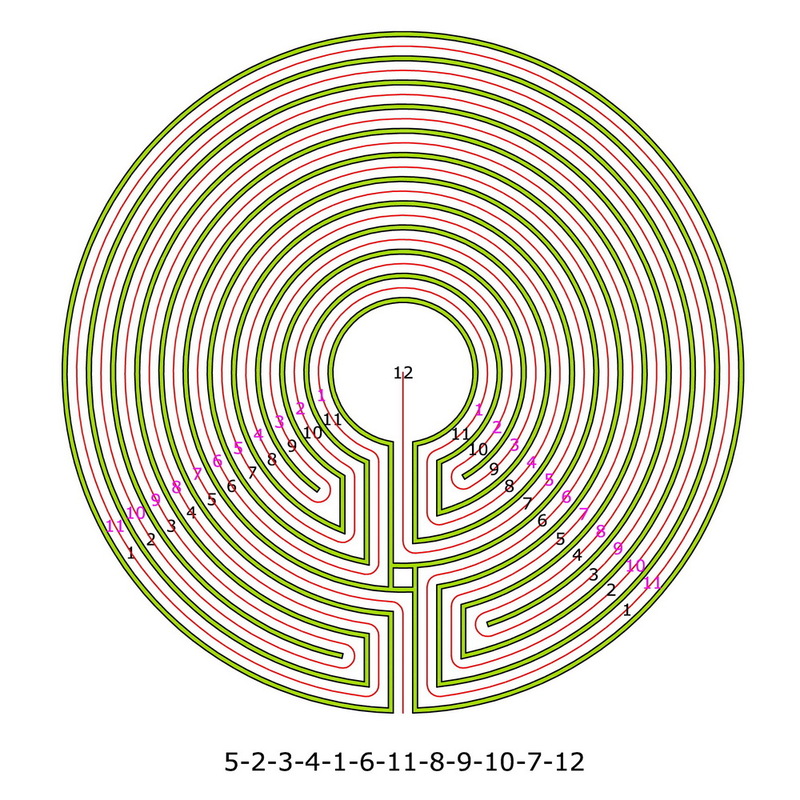 As Andreas proposed in his last article we can number the 20 segments for the 5 circuits in this 4-armed labyrinth. The sequence of segments can be derived from it for the pathways. Some segments form a connected section which runs through several quadrants. These segments can be marked by brackets. 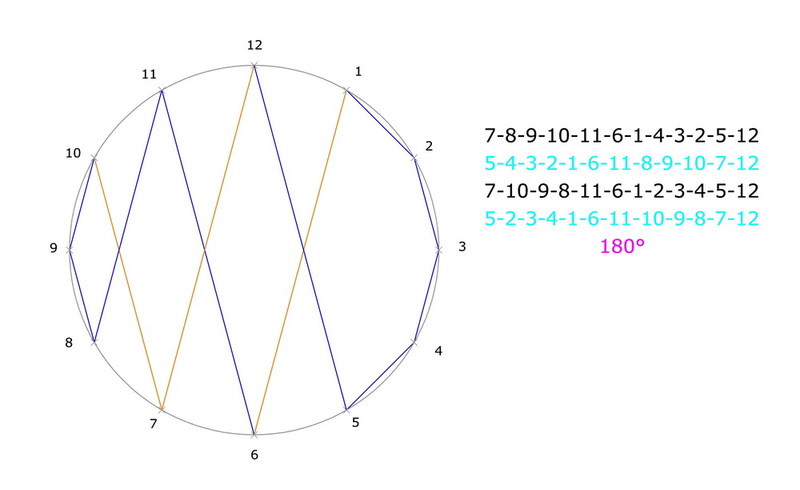 The sequence of segments then looks as follow: 9-5-(1-2-3-4)-8-12-(16-15)-11-(7-6)-10-(14-13) – (17-18-19-20)-21. I write the result a little bit differently than Andreas and still add the center at the end. Inside this labyrinth we have as a specific feature two segments which enclose the full length of a circuit. 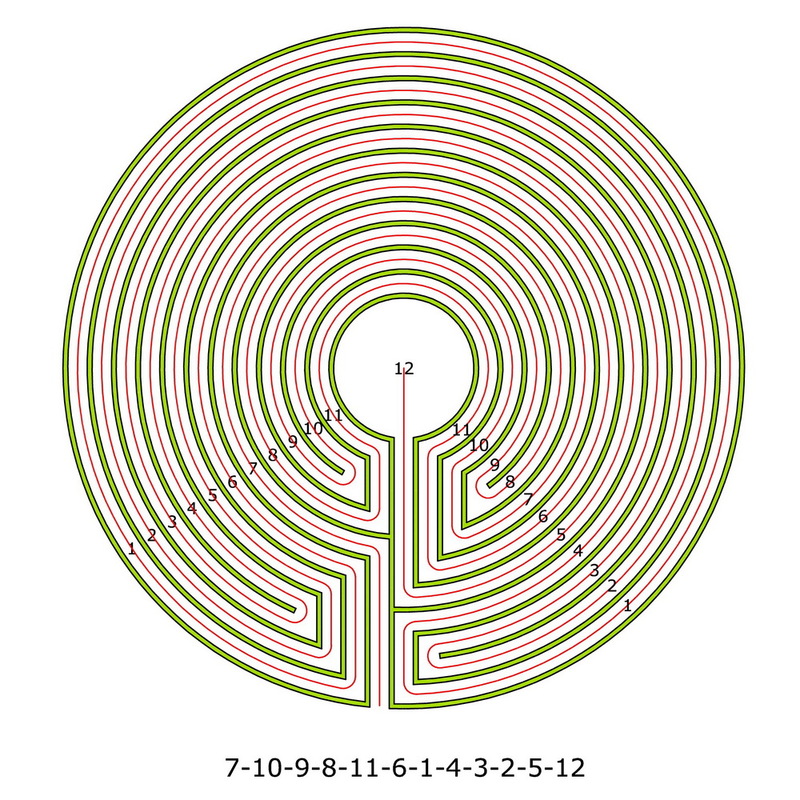 In one-arm labyrinths, each circuit is represented by one number. 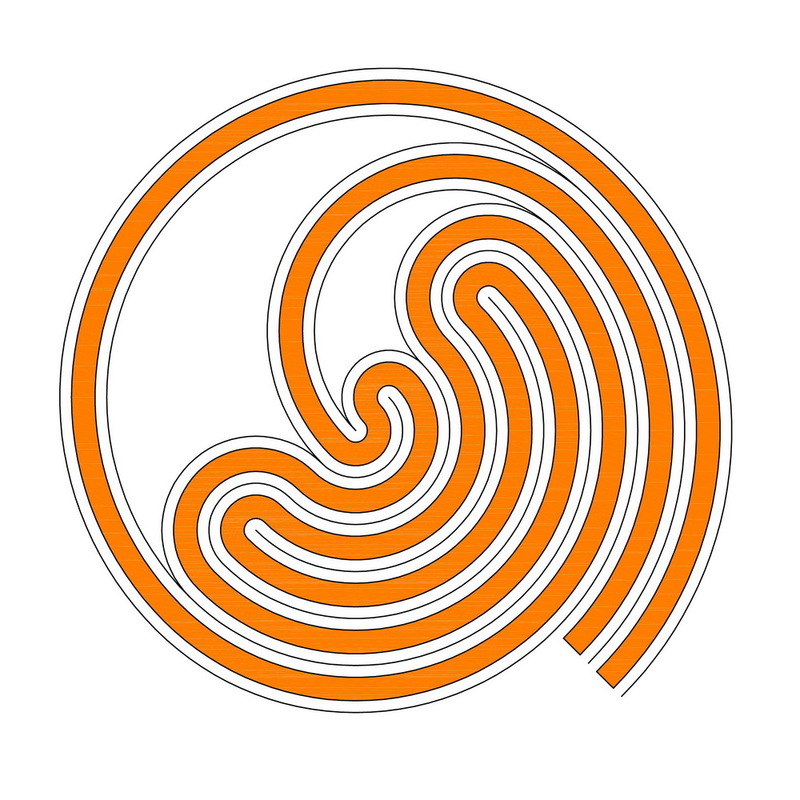 Therefore it is possible to capture even quite large labyrinths appropriately with the level sequence. In labyrinths with multiple arms, the pathway may repeatedly encounter the same circuit. Various possibilities exist to take account of this in the level sequence. For this, according to the number of arms, the circuits have to be further partitioned to segments. 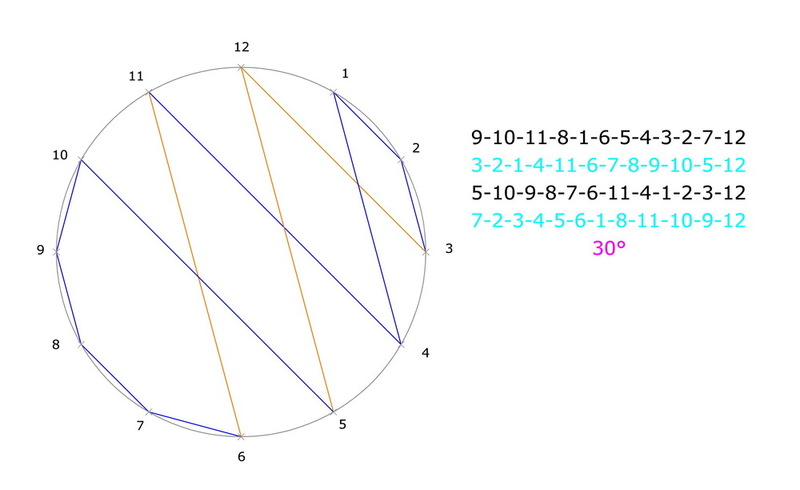 Here I will show a method in which all segments are numbered through. 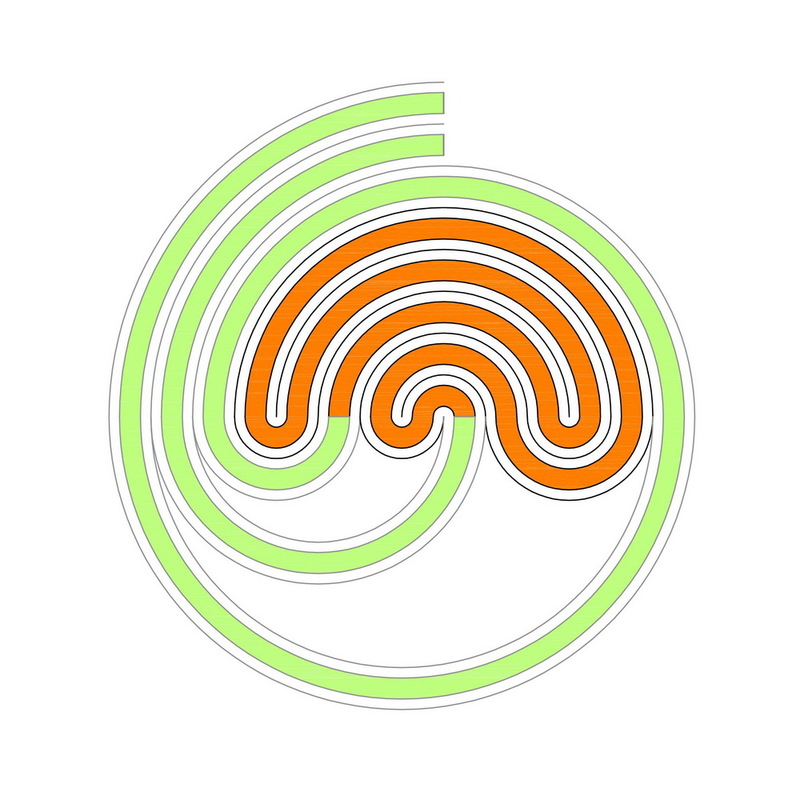 For this I use an example of a labyrinth that has repeatedly been presented on this blog. It has 3 arms and 3 circuits. First, each circuit is partitioned to three segments. One segment corresponds with a unit of the pathway between two arms. Next, the segments have to be numbered through. This can be done in different ways. Here I number them from the outside to the inside and one circuit after each other. Now we can track the course of the pathway through the various segments. This results in the sequence of segments encountered by the pathway. In labyrinths with multiple arms the level sequence thus extends to a sequence of segments. 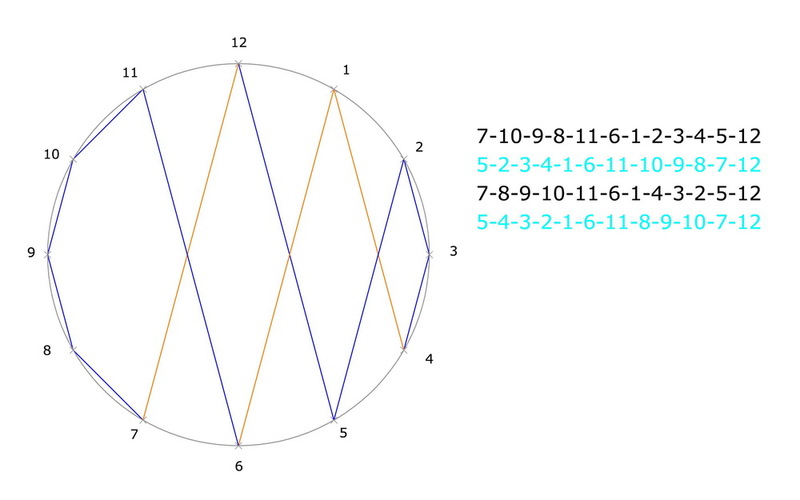 The sequence of segments of this labyrinth is 7 4 1 2 5 8 9 6 3. The length of this sequence of numbers is a result of the number of circuits multiplied with the number of arms. 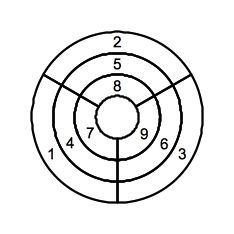 Thus, for a labyrinth with 3 circuits and 3 arms, 9 numbers are required. 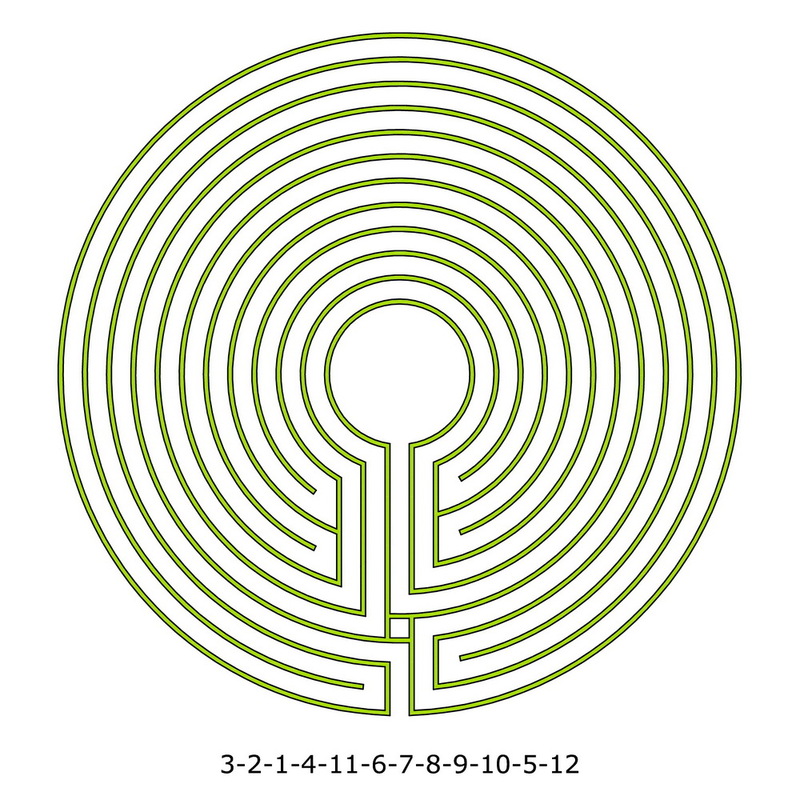 Whereas in a one-arm labyrinth with 3 circuits only 3 numbers are needed. However, besides the numbers no other information is needed. The sequence of segments itself determines where the pathway makes a turn or traverses an axis. In one-arm labyrinths this had to be indicated additionally by use of separators. In an earlier post „Type or Style / 6“ (see related posts, below) I had already mentioned the level sequence. And I had stated two reasons for why I do not use it for naming types of labyrinths. 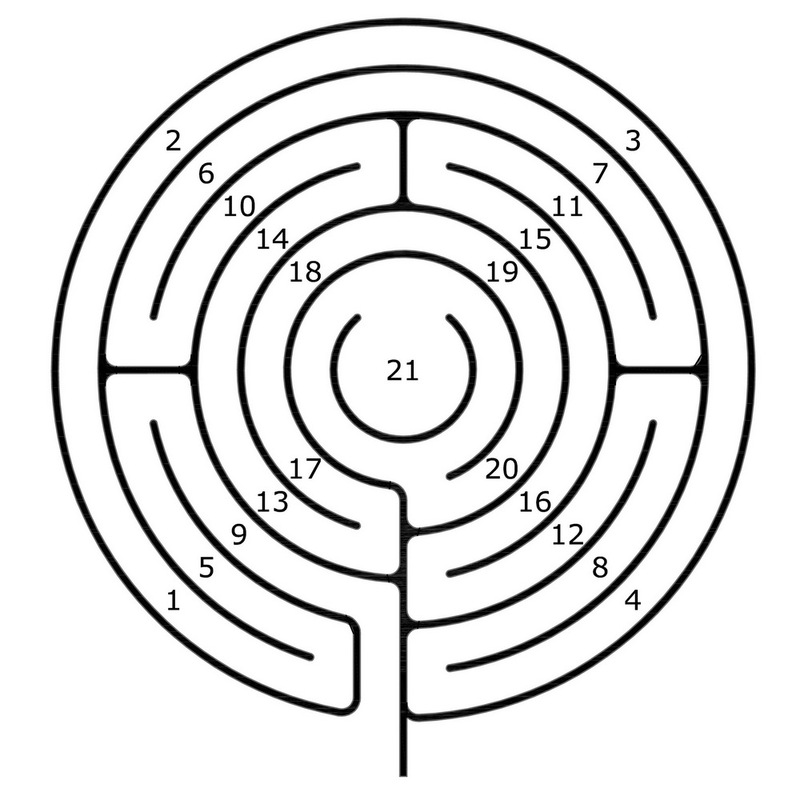 Among the one-arm labyrinths only in alternating labyrinths there exists exactly one type of labyrinth for each level sequence. If we also consider non-alternating labyrinths, in which the pathway traverses the axis, there can exist multiple courses of the pathway for the same level sequence. In labyrinths with multiple arms the level sequence may rapidly increase to a length and complexity that is difficult to memorize. Here I want to address the first issue further. I do this because there is a very simple solution for it. 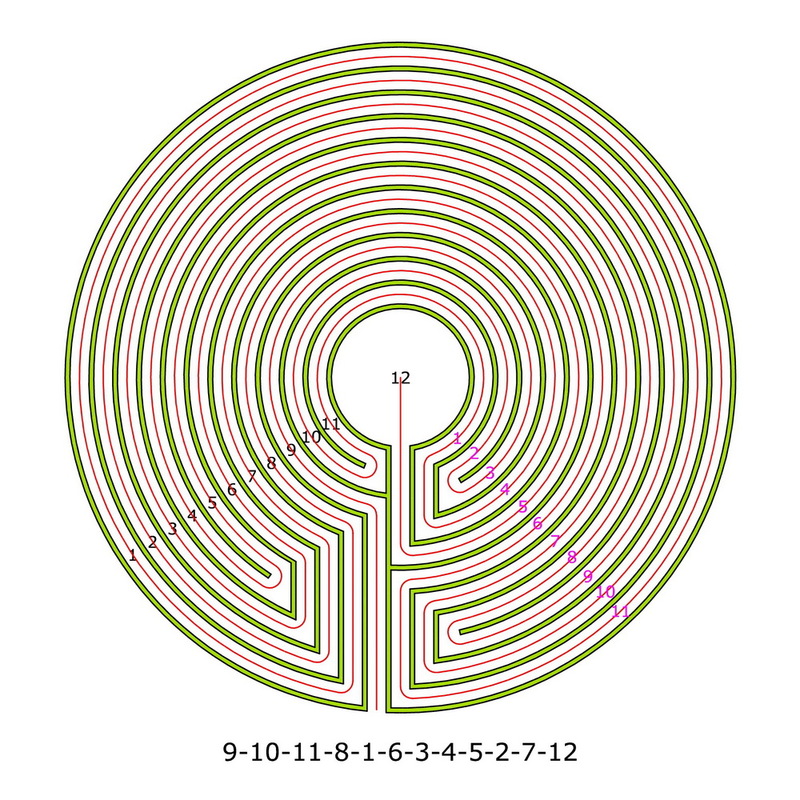 In one-arm labyrinths every circuit is represented by one number. 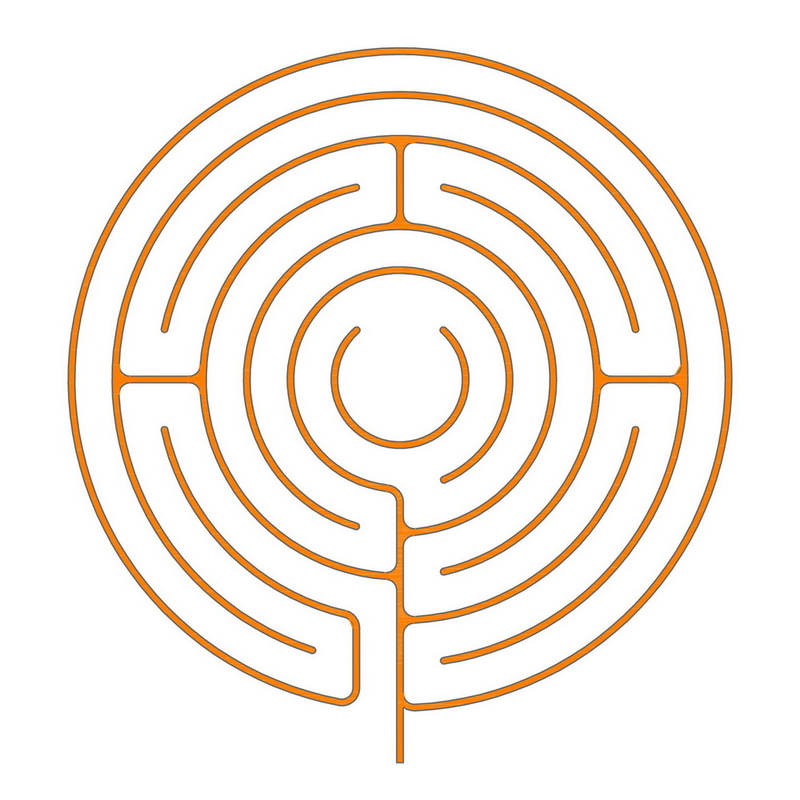 In real practice only few of the larger labyrinths will have more than 15 – 17 circuits. 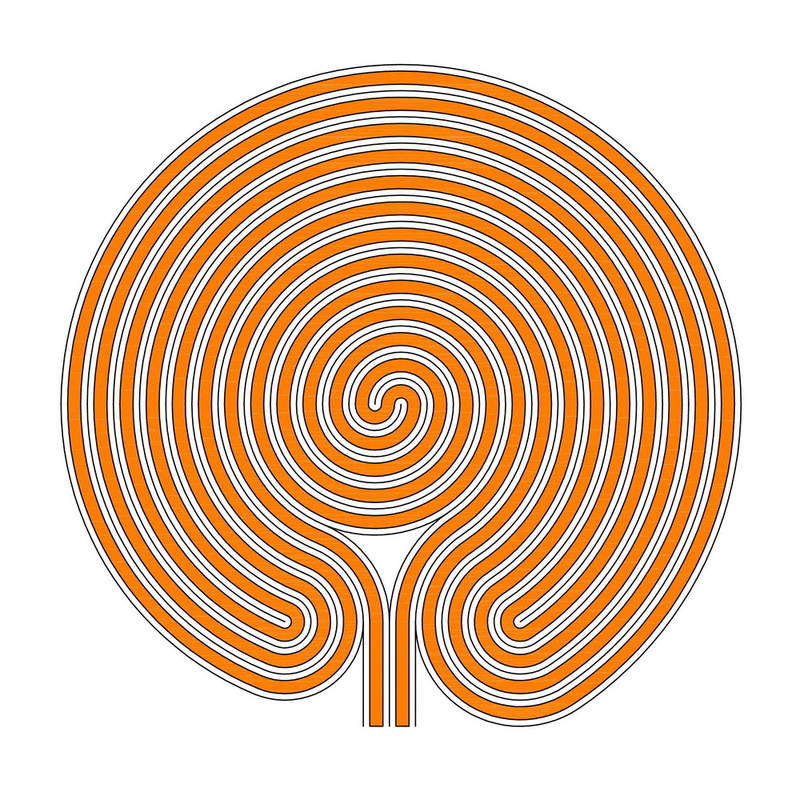 Most one-arm labyrinths have a markedly smaller size. Therefore these labyrinths could be quite simply be named with their level sequence. But there remains the problem with the ambiguity. 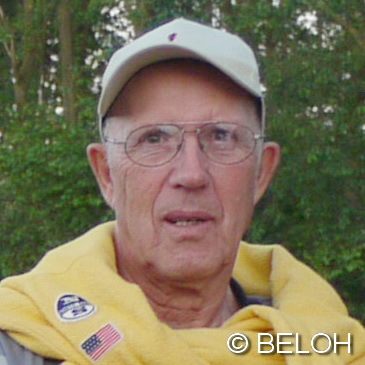 Erwin had elaborated on it in his post “The Classical 7 Circuit Labyrinth with Crossed Axis“ (see related posts, below). I will illustrate it here and use some figures of Erwin’s post. 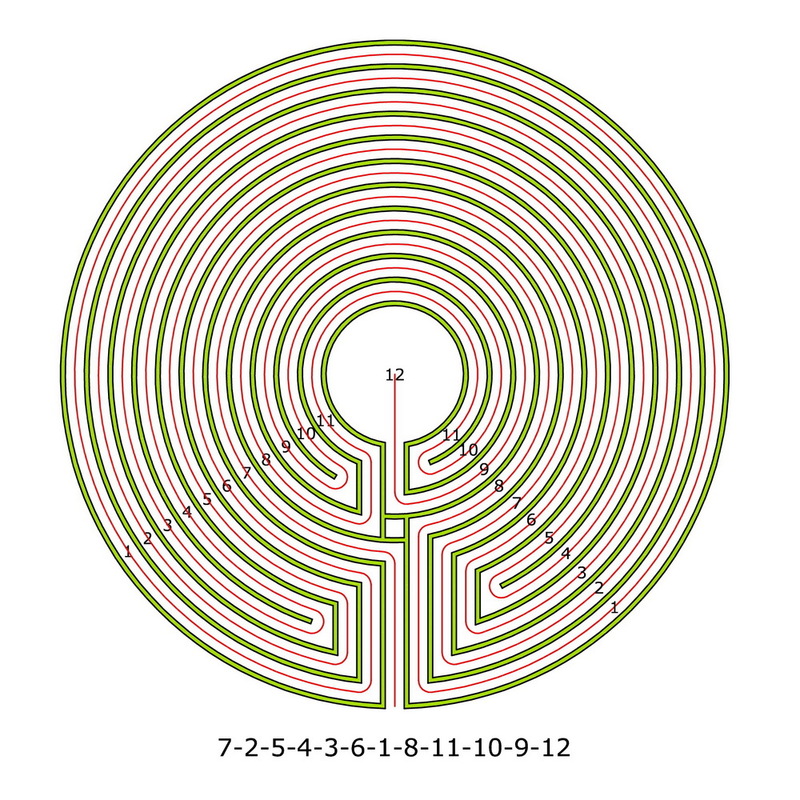 In Figure 1 three labyrinths with the level sequence 3 2 1 4 7 6 5 are shown. 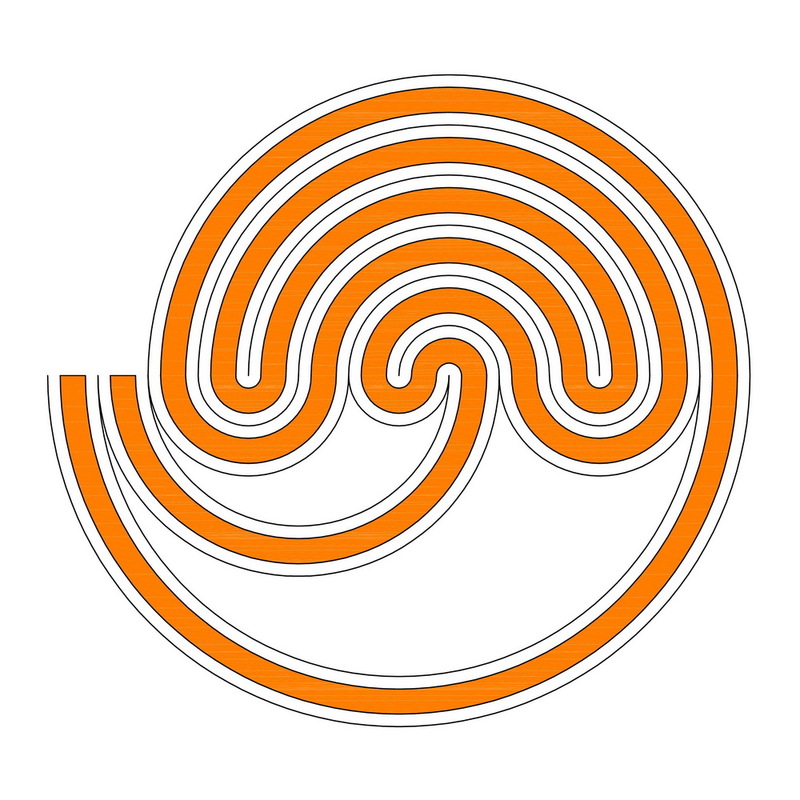 The first image shows the alternating Cretan type, the second and third images show non-alternating labyrinths with the same level sequence. In the second image, the pathway traverses the axis when changing from the 1st to the 4th circuit. In the third image it traverses the axis from the 4th to the 7th circuit. 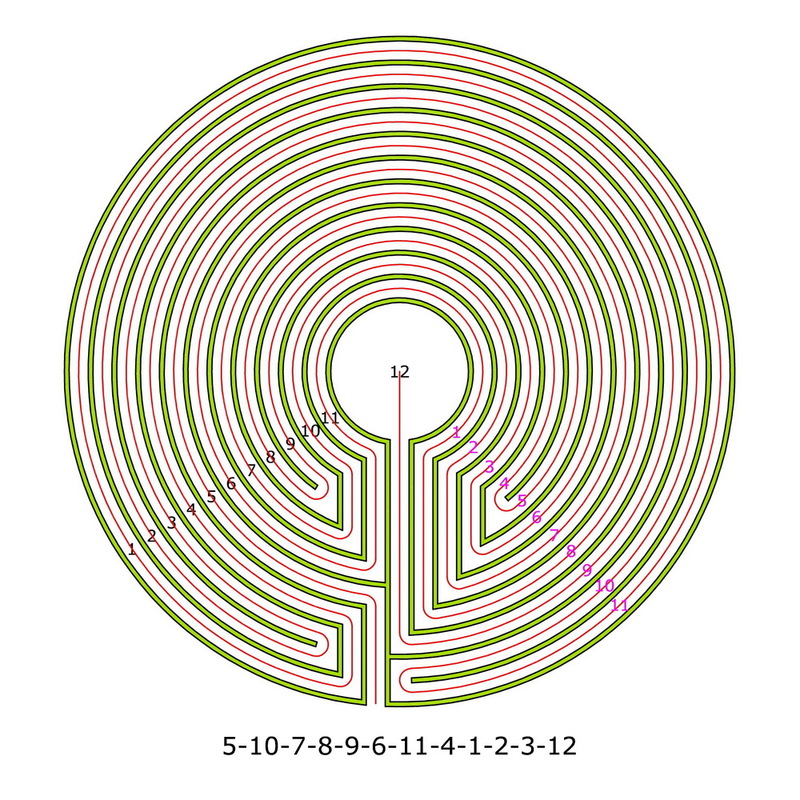 (There is an other labyrinth with the pathway traversing the axis twice, first from the 1st to the 4th and second from the 4th to the 7th circuit). 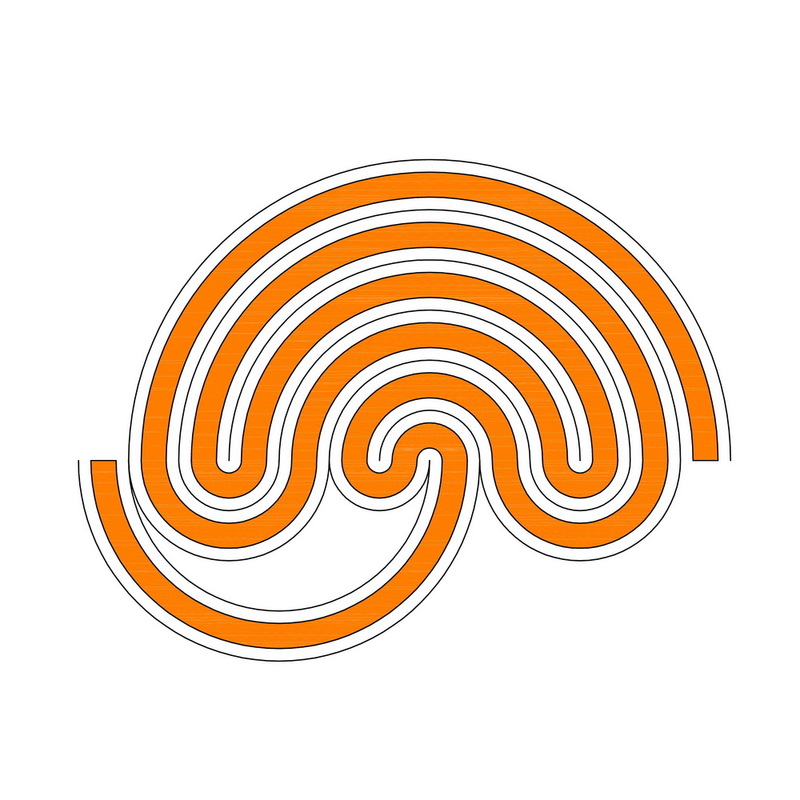 We thus are here presented with the only one alternating and several non-alternating types of labyrinths with the same level sequence. Now there is a simple solution, to take account of this in the level sequence. For this it has to be considered, that the single numbers (not numerals) of the level sequence are separated. This separation can be obtained in different ways, using blanks, commas, semicolons etc. These separators, however, can also be used to indicate how the path will continue on the next level. Therefore we could e.g. define: if the path changes direction from the former to the next circuit, we will separate the numbers with a vertical slash. If, on the other hand, the path continues in the same direction and thus traverses the axis, we separate with a hyphen. This enables us to specify the level sequence so that it is unique also in non-alternating labyrinths. I show this in figure 2 using the images from figure 1. Here we see for each labyrinth the unique level sequence with separators. The sequence of numbers is the same 3 2 1 4 7 6 5 in all three labyrinths. 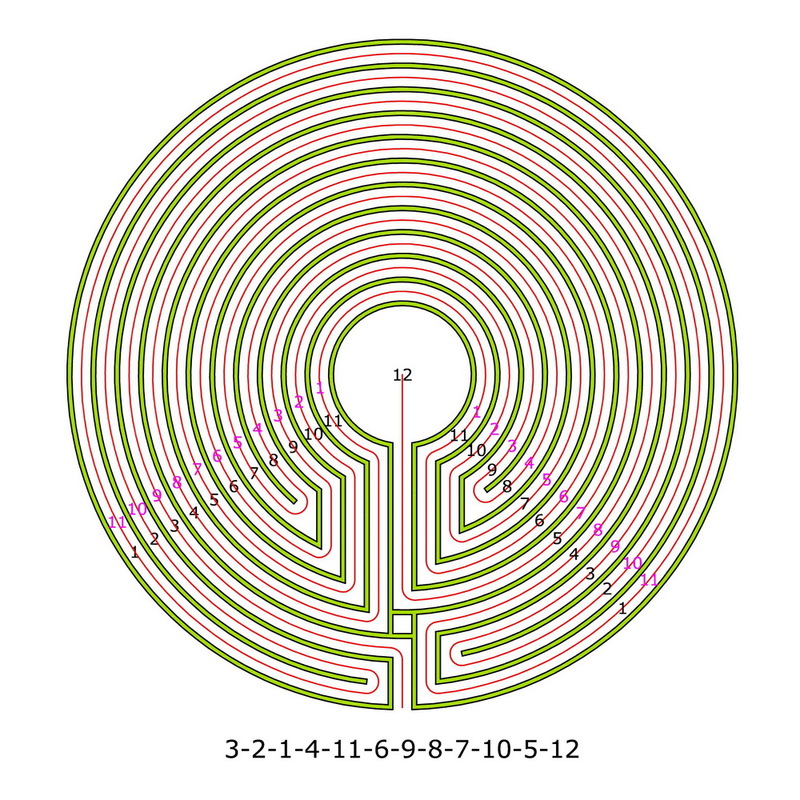 However, whereas in the alternating Cretan type all numbers are separated by slashes (as the path always changes direction when progressing from one circuit to an other), the level sequence in the second labyrinth is written with a hyphen between 1 and 4, and the level sequence in the third image with a hyphen between 4 and 7. What matters is that in the level sequence it is indicated where the path traverses the axis. 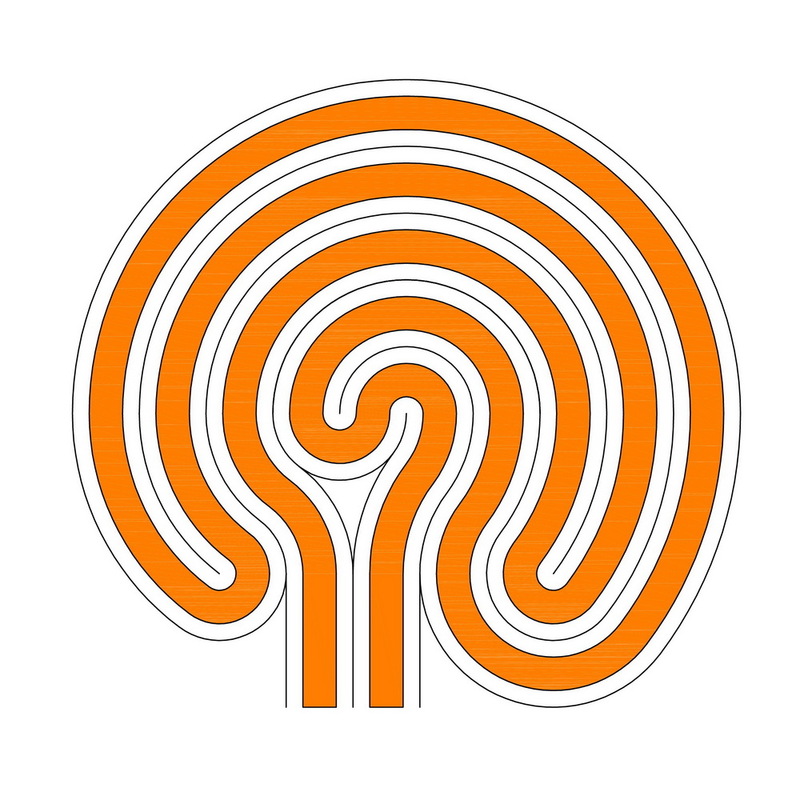 With this specification it is now possible to give a unique level sequence to each course of the pathway and thus a unique name to each alternating and non-alternating type of labyrinth. And vice versa: How to make a Wunderkreis from a Babylonian visceral labyrinth. That’s possible, at least with the Babylonian Umma Labyrinth. 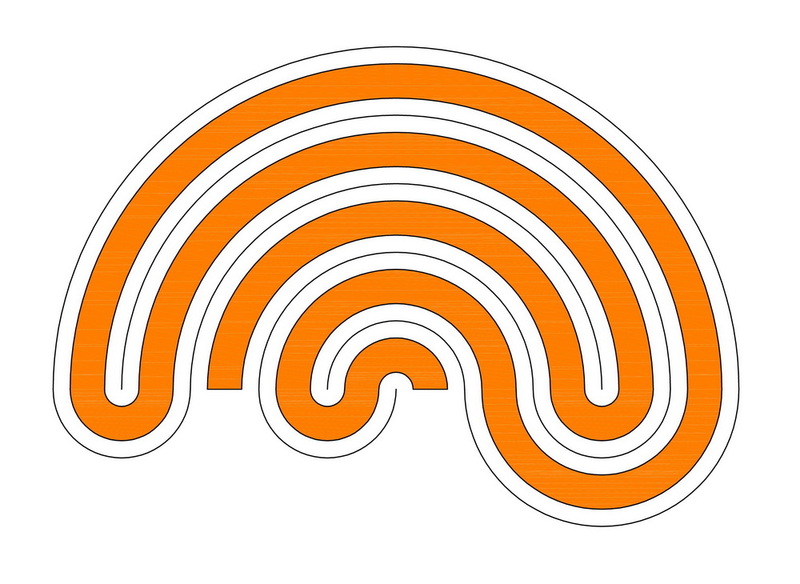 The essentials of a labyrinth ly in the course of the pathway expressed by the level sequence, not the external form or layout. More exactly Andreas calls this the pattern. The Umma labyrinth has two turning points surrounded by two circuits each and a meander in the middle. The two entries ly outside. 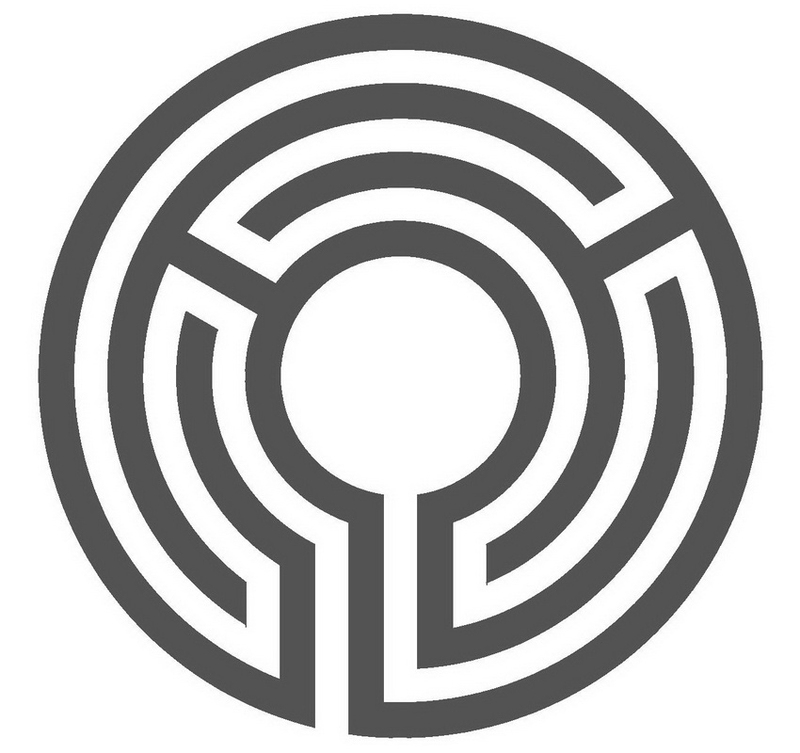 There is only one, unequivocal way through the labyrinth. The Wunderkreis has a double spiral in the centre and two other turning points with arbitrarily many circuits. Besides, a side has a circuit more than the other. The entries are in the middle section. In order to indicate the single developing steps I first transform a “completely developed” Wunderkreis into the smallest possible version. 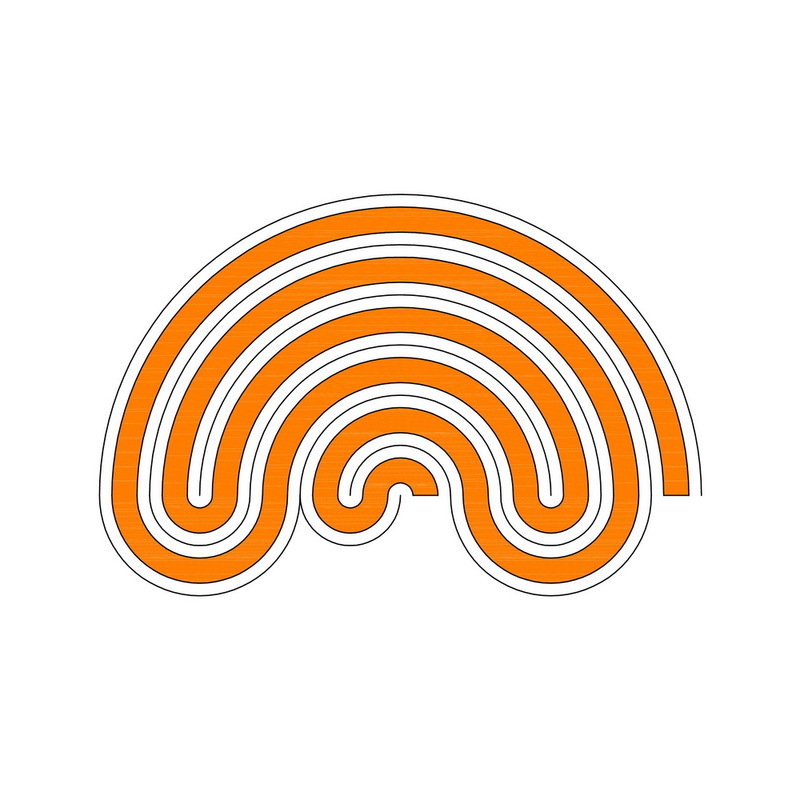 It looks thus: A meander in the middle and two other turning points with a total of three circuits as to be seen in the labyrinth type Knossos. To be able to compare this small Wunderkreis to the Umma labyrinth, I lay all centres (at the same time the ends of the boundary lines or the turning points) on a single line. Just as if I folded the triangle built from the turning points. Both entries are here in the middle section, in the Umma labyrinth they are outside and side by side. Besides, there is one more circuit on the left side. Now I add one circuit to the figure and the entry will change to the outer side on the right as well. I now turn the second entry to the left side. 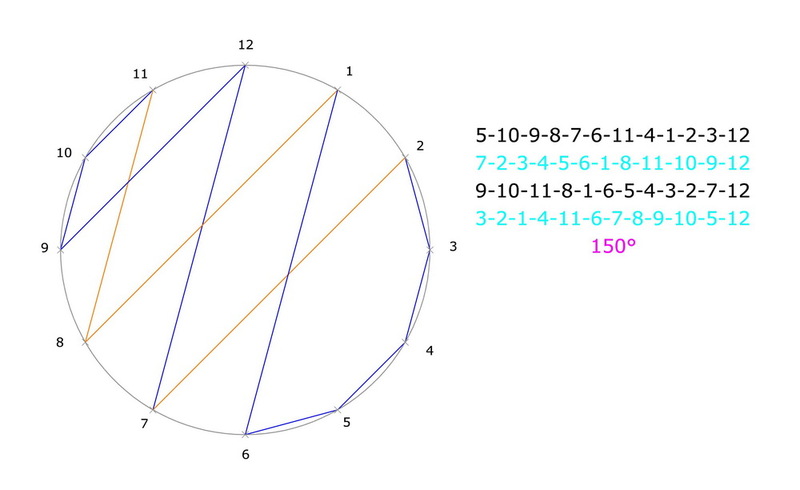 As a result, the two entries point in different directions. Hence, I turn the right entry completely to the outer side on the left beside the left entry. As I do that geometrically correct, two empty areas appear. Now I extend both entry paths by a quarter rotation upwards and turn the whole figure to the right by some degrees . Thus I receive the complete Umma labyrinth. If I want to develop the Wunderkreis from the Umma labyrinth, I must leave out some circuits, turn the whole figure and finally raise the middle part. The supplements made in the preceding steps are emphasised in colour. The nucleus of the visceral labyrinth contains the Wunderkreis. Surely the Wunderkreis as we know it nowadays was not developed in this way. There are no historical documents to prove that. However, in my opinion the relationship of both labyrinth figures can be proved thereby. They are not simply spirals or meanders. These elements are rather included and connected in a “labyrinthine” way.